Our Art foundry has a three-dimensional laser scanner, to reproduce on a computer, your parts, sculptures and works. Solyfonte offers 3D scanning for all your parts. Transferred to a computer, our prototype designers can perform for you all kinds of changes on the 3D file. We can also send the reproduction to a printer, for the realization of a wax prototype. The 3D scan or the three-dimensional laser scanner is a machine that virtually reproduces the forms of a physical object. You have a part in your possession and want to make an identical reproduction. You have an object, but you want make changes to it. You wish to assemble different parts in 3D. You wish to digitally archive your parts. Before any operation, our prototypists designers are responsible for calibrating the 3D scan, depending on the piece to scan. Our machine takes the form of a cabin, consisting of a laser, a camera and a 360° turning-table. The scan of your part is done in a specific order. First we place your piece on the rotating cab tray. The maximum dimensions of your parts can be up to 30 cm in diameter by 60 cm in height. 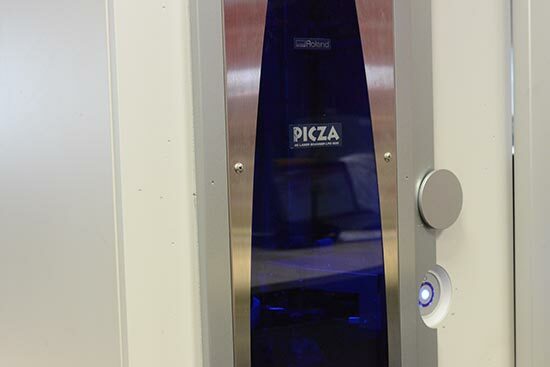 As soon as we launch the machine, your piece will be scanned through a structured white light. The laser will scan the piece at several points, line by line. Depending on the complexity of the part, the scan of your part will be shorter or longer. Note that the machine is fully autonomous and automated. When the scan is complete, the computer will generate a report. The scan is carefully checked to ensure perfect reproduction. The record is then taken by the developers to retouch any defects in the scan then treat it according to client needs and requests.